JEFF CONAWAY will be on America Online on Tuesday, October 8th at 9PM ET. Go to Keyword: Babylon 5 for more info! team responsible for producing "The Coming of Shadows!" NEW! 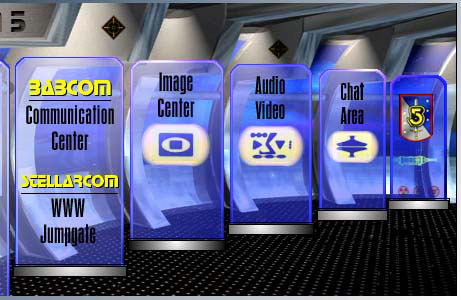 Take a look at our new Trivia Area and test your knowledge of the B5 universe! UPDATED! Online Episode Guide Now Available. Also contains schedule of upcoming episodes! Be sure and check out the Special Elements section for previews, trading cards, and our exclusive Babylon 5 Calendars! Find transcripts, logs, and more. Babylon 5, characters, names, and all related indicia are trademarks of Time Warner Entertainment Co., LP. ©1996 Time Warner Entertainment Co., LP. All Rights Reserved.